RRSport S'Charged for $21.8k - CP or NP? 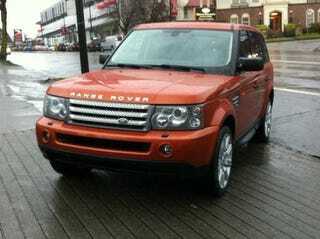 There's a 2006 Range Rover Sport Supercharged in Vesuvius Orange (aka Launch Colour) and OEM Stormer 20-inch wheels for sale in my city (Vancouver, BC). It's got 140,000 KMS on the dial (like 85,000 miles), reportedly no accident history, looks relatively clean, and it's a U.S. import. AND it's got 390 bhp that makes one hell of a noise and drinks one hell of a lot of petrol. High mileage early RRSports are now beginning to trickle below $25k, so this price isn't a surprise. The mileage is a bit high, but I'd be driving it with my fingers crossed at all times while simultaneously touching wood. Because Land Rover reliability. But still, it's an awesome early RRSport example, just the way it was toured around auto shows in 2005, and just the way, when I was 15 years old, would of specced mine had I been given the cash. But I digress, OPPO, NP or CP?